Keeping up with the latest toy trends can be a nightmare, especially over Christmas — we’ve all seen the cautionary tale that is Jingle All the Way, right? But luckily, we’ve had a word with the ghost of Christmas future and have been able to portend what the greatest Christmas gifts will be for hard-to-please six-year-olds this year (here’s a clue: not one of them is a puppy). Some of them are sure-to-sell-out toy sensations, and we can see why. 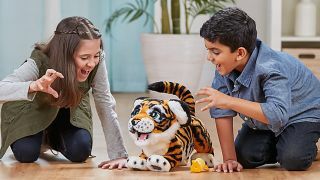 With advanced animatronics, better-than-ever interactivity and oodles of ways to play, the market for animal teddies that respond and play along with your child is thriving, and they make a totally adorable and impressive addition to their toybox. Keep your eyes peeled for flash savings across the holiday season at retailers such as Argos and Smyths Toys for great savings on games, toys and gifts for kids. Some, on the other hand, are timeless classics that may have pleased you as a six year old, and will probably even go on to please your six year olds’ future six year olds. We’re talking board games, the likes of Monopoly Junior and Connect 4, that are fun and simple to play, have enduring appeal, and can get all the family involved over Christmas and beyond. Roarin’ Tyler really is the next best thing to getting your child a real tiger cub. In fact, he’s better. He likes to roar, play, respond to your speech, and, like all pets, he loves ear scratches. With over 100 combinations of movements and sounds, he’s extremely interactive and kids are sure to fall head over heels for him. Plus: no walking or feeding required. Tyler almost gives the Hatchimals a run for their money as the best kids’ Christmas gift, with both featuring in our top guide for Christmas gifts for 6 year olds. These adorable Hatchimals respond to the love and care their owners give them while they’re in the egg, so they’re a great way to teach your kids to nurture, as well as being hugely interactive. The twin “giravens” start off as a speckled egg which hatches with a little TLC, and once they’re out, they talk, sing, play games, tell jokes, and even argue with each other. On the expensive side, certainly, but they provide hours and hours of fun, and are sure to never leave your child’s side. Little ones can now get in on the drone action this festive season with the Little Tikes My First Drone. With auto-hover technology incorporated for easy flying, this is the perfect entry-level drone for young kids. Armed with protective propellers and auto-shut off for added safety, there's little chance they can cause much damage with this beginners' kids' drone. Plus, the remote control is specifically designed for small hands so the kids should have no problem controlling it themselves. Be warned, this drone is not ideal for outdoors, but if you have enough indoor space, this is a great gift idea for any 6 year old in your life this Christmas. This Bratz Styling Head Doll is an awesome way for kids to get creative and experiment with style, and who knows, it might even mark the beginning of a lucrative career in hairdressing! They can style, colour, and add a bit of glittery pizzaz to Yasmin’s hair or their own — don’t worry, it’s completely temporary, but the joy they get from showing off their new ‘do is sure to be priceless. This is one of the best Christmas presents for 6 year olds who like hairdressing. Rather than teach your kids to be cold-hearted property moguls, or take hours to play like the grown-up version, these fun themed Monopoly Junior sets will teach them to count, add, and take turns, allowing them to buy recognisable locations from their favourite worlds and play as beloved characters. An excellent introduction to the world of Monopoly that the whole family can enjoy, isn’t too complicated, and builds maths skills along the way. The ideal Christmas gift for children who like board games. You'll be finding the counters everywhere! The secret to Connect 4’s longevity has to be its simplicity. It’s quick, it’s fun, and everyone knows how to play it, so there’s no faffing around with instructions, you can just jump straight in. And it’s not just restricted to six year olds, either: you’d be surprised how competitive grown-ups can get as soon as the board comes out on Christmas Day. A super-speedy game that can be played again and again, with real lasting power. So they can’t jump off buildings or crawl up walls, but when it comes to playing Spiderman, your kids can do the next best thing with this web-blaster. All they have to do is pop on the glove, mount the can in the holder, and spray away the bad guys with the included can of Web Fluid, because what kid doesn’t like a bit of messy fun? When the web runs out, it makes a great covert weapon in water fights, giving it real staying power. If your little one is obsessed with Marvel characters, this is sure to delight them on Christmas morning. This friendly vintage-style robot makes a sweet feature in any kid’s room, and keeps their cash safe too. A smart money box is a great way to teach children to count and save their pennies. They’ll get a real sense of pride watching the number on the digital display go up as they put in their money, joy as the robot counts them out, and achievement when they can spend it on something they’d like after filling it up. Educational, and really darn adorable, to boot, this is the perfect present for any 6-year-old who has starting collecting pocket money. Still got more children to buy for this Christmas? Check out our guide to the best Christmas gifts for 4 year olds.